Football fans are mourning the loss of the Kent-based football comic Striker after a lack of investment led it to print its final issue. The cartoon strip was the brainchild of cartoonist Pete Nash, from Ightham, and followed the fictitious second division Warbury Warriors Football Club. His company Striker 3D, located in Tonbridge, published the final edition - issue number 87 - on Thursday. Mr Nash said he knew the odds on its success were always against him. The Striker was launched at the end of August 2003 after running as a comic strip in The Sun newspaper for 18 years. Characters in the 32-page colour comic were brought to life through state-of-the art 3D graphics, first pioneered by Mr Nash in 1998 in The Sun. Striker was the world's first 3D-generated cartoon strip. Falling sales - from 29,000 when it launched, to around 10,000 - and a lack of investment have been blamed for its demise. Mr Nash said when Striker started as a comic "we knew that we didn't really have the funds to sustain a weekly paper, but we hoped its popular following would make up for the shortfall in extra investment". He told the BBC News website that it had been hoped corporate investors would have shown an interest. "We were victims of our own uniqueness... the investors didn't understand the concept of it," he said. 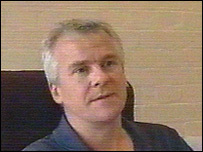 His company, Striker 3D, even became a PLC in the search for extra funds, raising £200,000 when readers became shareholders. Since the announcement that it was to print its final edition, Striker has been inundated by fans expressing their disappointment. Pete Nash said readers had been buying up merchandise which included back issues, mugs and calendars. He estimated that between £6,000 and £10,000 of merchandise had been sold in the past week alone. "They can't understand why something they enjoyed so much will be gone... their Thursdays won't be the same again," he said. Striker 3D has nine staff in total, but Mr Nash said he would try to save their jobs. "We will be talking to newspapers and publishers, and there has already been a lot of interest from China and other Asian countries. "I'm hopeful that we'll be able to resurrect it, and be back for the start of the next season. "I don't regret giving it my best shot."